Author Gene Pisasale of Kennett Square has just published a book containing many of his articles about Chester County history. Ever since he was in grade school, Gene Pisasale has been fascinated by the intricate tapestry of history. Growing up in the Main Line area of Philadelphia, "I just fell in love with the story of America," Pisasale said during an interview last week at his Kennett Square home. "And this area, in particular, is so rich in history." After a professional career in petroleum geology, and later the investment industry, Pisasale said he "retired" in 2010 and has now written eight books focusing on the history of Chester County and the surrounding regions. His column, "Living History," appears in the Chester County Press and other media outlets, and Pisasale is a regular lecturer at area community organizations and historical societies. 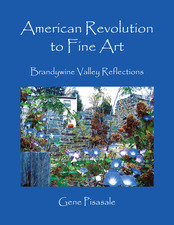 His new book, "American Revolution to Fine Art: Brandywine Valley Reflections," published last week, combines 40 of his columns in one volume. They highlight the region's artistic heritage, its signature events (like the Pumpkin Carve), its little-known history (such as the abandoned village of Frick's Lock), and its colorful characters. The book is illustrated mostly with Pisasale's own color photos. Pisasale said he used to be a Civil War devotee -- and he still has a collection of artifacts connected to the war -- but living so close to Revolutionary War sites has turned his interest to the revolution and its major players. "They say that you should do what you love, and the rest comes easily," he said. "United States history is so deep, and there are so many stories that are still waiting to be discovered." Pisasale is fascinated by the Ring House and the Gideon Gilpin House in Chadds Ford, two neighboring structures known as the headquarters of George Washington and General Lafayette during the Battle of the Brandywine. He's in the midst of trying to prove that Lafayette really did use the Gideon Gilpin House (which is currently closed to the public) after doubts were cast by a descendant of the family who used to live in the home. Pisasale sums up his exploration of that issue in a lecture he presents called "A Tale of Two Houses." As a speaker, Pisasale can tailor his presentations to senior citizens or grade-school students. He is particularly concerned that students are not learning enough about U.S. history in school. To grab the attention of students who consider history boring, Pisasale said, "Visuals are very important. If you can grab their attention for 30 seconds, they pay attention. I try to get them engaged in the story of ourselves. It's not the story of some general who did something a long time ago, it's our story. There's no disconnect. American history is the story of all of us." Pisasale told an anecdote about Carl Closs, who has presented historical programs dressed as George Washington for decades. "He told me once that he was doing a Q&A and someone asked, 'So, you were our first President, is that right?'" Pisasale said, laughing. "I mean, I'm not sure how you could possibly be an English-speaking, U.S. citizen and not know that." In his extensive research for his books and columns, Pisasale said he has read plenty of authors and can detect any bias on their parts. "Pretty much every historian will have a viewpoint," he said. "And I'm not immune to that. But I make sure that I'm honest and I state all the facts. I'm not leaving out any facts because they happen to be inconvenient." Pisasale said it took about two months from finished manuscript to published book, and that boxes of books were just beginning to be delivered last week. "The book is pretty wide-ranging," he said, flipping through the one copy in his possession last week. "It covers over 300 years of history, and each chapter is about three or four pages long. I picked all my best pictures, and some taken by my wife, Phyllis, as well as a few others." Pisasale will be promoting the book at his lectures and book signings in the coming months. But he's just now taking on a new direction in his presentations. "I have bought a full Continental Army uniform, and I'll be dressing up to portray Alexander Hamilton for first-person presentations," he said. "I've done a lot of research on him, and he's one of the least-known figures from early America. He was the first secretary of the treasury, so he and I kind of speak the same language when it comes to banking and investments," he added, smiling. For more information on the new book, and on upcoming appearances by Pisasale, visit www.GenePisasale.com. String Quartet ETHEL Tours "The River"